The states of California and New York are raising their minimum wage price up to $15. 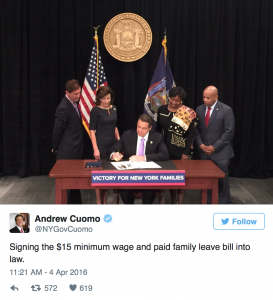 New York signed a piece of legislation that states a $15 minimum wage budget per hour. By the year 2023 California will be the second state to have the minimum wage raised up to that price. Also, the paid family leave bill was also signed. A system that tracks the prices of goods and services throughout the nation, showed that $15 wage in California buys much less that it would in most other states. This occurs because California has the highest prices in the nation. I believe that this news is important because it will motivate more people to work. Although jobs may be scarce, the motive of going out there and search for a job, will improve society as a whole. This relates to the class because we discussed governmental issues and how they act upon the societies necessities. Also, we discussed how global corporate citizenship focuses on how people matter. Next Will Apple’s Newest Item be an Electric Car?